"And I will give you pastors according to mine own heart, which shall feed you with knowledge and understanding." And all things are of God, who hath reconciled us to himself by Jesus Christ, and hath given to us the ministry of reconciliation; To wit, that God was in Christ, reconciling the world unto himself, not imputing their trespasses unto them; and hath committed unto us the word of reconciliation. Now then we are ambassadors for Christ, as though God did beseech you by us; we pray you in Christ's stead, be ye reconciled to God. ​On March 6, 1961, the late Albert W. Johnson and Helen Vail Johnson welcomed the second of their four children, Rev. Allen Johnson. Rev. Johnson grew up in the small community of Goodwill, Louisiana. He attended St. Bernard High School and graduated in May of 1979. He received his Bachelor’s degree in Theology on May 10, 2000, from the Union Baptist Theological Seminary in New Orleans, Louisiana. He accepted Christ and was baptized on April 5, 1973 by the late Reverend Alfred Ballard, Sr., at the Greater Mount Olive Missionary Baptist Church of Goodwill, Louisiana. Rev. Johnson served in many areas of the church including Sunday School Teacher, Member of the Youth and Mass Choirs, and on the Board of Deacons. It was there that Rev. Johnson accepted his calling into the Gospel Ministry. He proclaimed his first message on August 1, 1993, entitled: “If I Had To Be Hooked On Anything, I Rather Be Hooked on Jesus.” (St. John 15:1-5). Rev. Johnson served faithfully under the leadership of the late Reverend Willie Davis and was licensed by succeeding pastor, Reverend Clarence Riley, Sr. at the Greater Mount Olive Missionary Baptist Church. Rev. 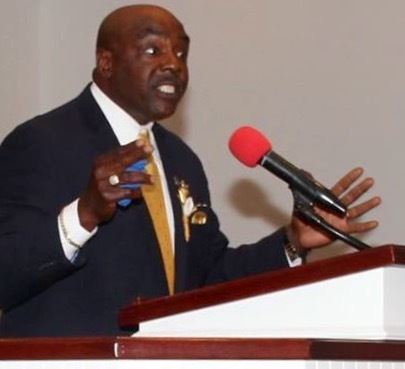 Johnson is a member of the Christian Ministers Missionary Baptist Association of Plaquemines Parish, where he serves as third vice president. Reverend Allen Johnson is married to the former Shelly Jiles of Braithwaite, Louisiana. They were joined in holy matrimony on August 5, 1995 at St. Andrew Baptist Church in Braithwaite, Louisiana by the late Dr. Warren V. Cooper, Jr. They are the parents of Monique Danielle Callio and Allen Jr., son-in-law, Jermal Marquis Callio, Sr., and grandparents of Madison, Makenzi and Jermal Marquis, Callio, Jr.
Rev. Johnson became a member of Saint Andrew Baptist Church, where he served faithfully. He was ordained on April 2, 1998 under the auspices of the First District Baptist Association. Rev. Johnson was installed as Pastor of Greater Mount Sinai Baptist Church on February 24, 2001 under the direction of the Christian Ministers Missionary Baptist Association. Pastor Johnson believes that if we are going to grow the ministry in the grace and knowledge of our Lord and Saviour Jesus Christ, we must offer it, package it, present it and we must be consistent in the way we live it. Pastor Johnson knows that it is not about him, but that it is all about Christ Jesus. To God Be The Glory for the Great Things He Hath already done; for the things He is doing, and for All the Great Things He Shall Do!